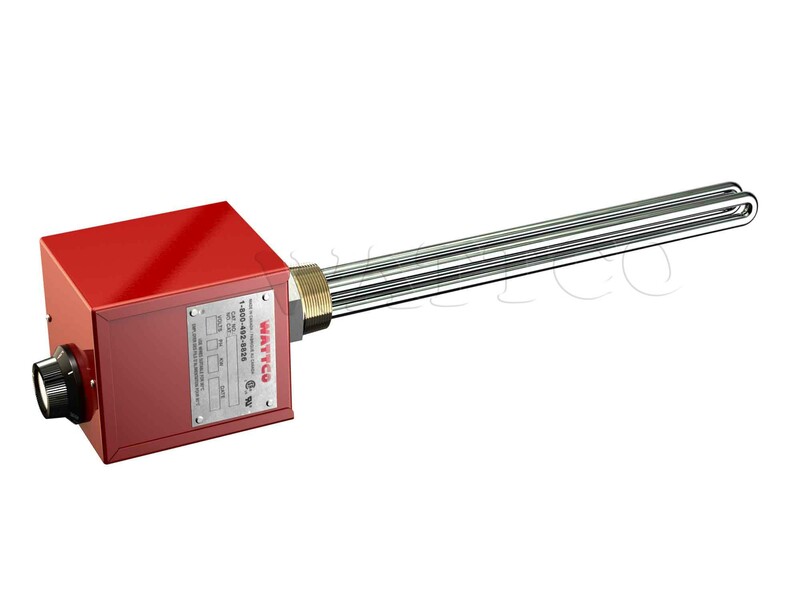 Flanged industrial heaters are commonly used in many chemical, petroleum and water based applications (https://www.wattco.com/2012/11/chemicalprocess-industry-documentation ). Consisting normally of an ANSI rated flange with several hairpin elements or bugle tubular elements extending from the face of the flange, this electric immersion heater uses direct heat application to the liquid medium. A thermowell is often used within the bundle of elements to allow for a probe (either a thermocouple, RTD or basic mechanical thermostat) to relay temperature readings to a digital controller that cycles and maintains the desired target temperature. Often a high limit sensor is also used to help protect liquid mediums from over heating and, offers protection to the flanged heater as well. Wattco flanged immersion heaters allow the flexibility of using many different alloys to help resist corrosion and maintain life longevity of the flanged heater. Steel flanges are typically used for lubricant oils, heavy and light oils, waxes as well as mildly corrosive liquids and low flow gas heating. Process water, soap and detergent solutions as well as demineralized or deionized water applications often use steel flanges. Stainless steel flanged heating elements are used with mildly corrosive solutions as well as severe corrosive solutions. Food applications also use stainless steel for sanitary purposes. The sheath materials used can be steel, stainless steel, copper as well as exotic alloys such as inconel, hastelloy and titanium. Extremely corrosive environments such as salt water must use titanium alloys to avoid sheath breach over excessive durations. 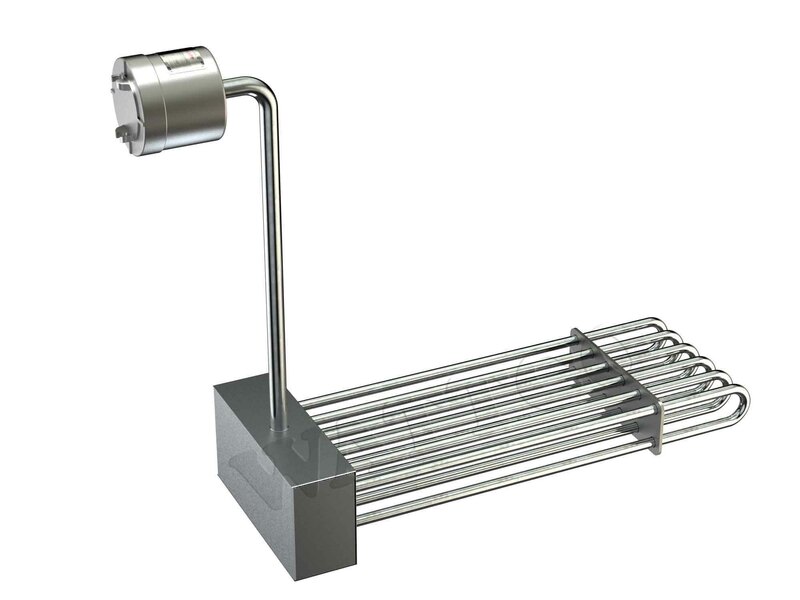 Circulation Heaters (or in line heaters) use flanged immersion heaters in many applications. It often involves a pump that flows liquid through a closed pipe circuit (ie. water or glycol solution) that is reheated. The required wattage to heat the liquid is highly dependent on the flow rate (gallons per minute). The medium enters an inlet opening, gets heated up as it flows within a chamber and exits the outlet nozzle where it circulates throughout the piping circuit. It is important to have the pipe circuit insulated to prevent excessive heat loss as the heated liquid travels thought the circuit. Temperature probes such as a thermocouple or RTD, is used in conjunction with the electric immersion heater to maintain the liquid at the desired temperature. Many applications use liquids with low flash point and, require explosion proof housing (NEMA 7) to avoid potential mishaps. These are available with all Wattco flanged and screw plug heaters. Drain valves can be installed to allow for easy maintenance by purging the liquid from the vessel and cleaning the tubular elementsfrom any residue that can build up over time. Circulation heaters can come with legs for horizontal or vertical installations depending on your application and your spacial requirements. Wattco inline heatersare an exceptional choice for heating process liquids,to the materials of construction. Screw plug heaters are immersion elements that are used with smaller applications. Known for their versatility and easy installation, screw plug heaters are used in food industry, chemical and HVAC systems through many applications. Standard NPT fittings come in brass, steel and stainless alloys and they are available in steel, stainless steel and brass. More corrosive applications require titanium and inconel alloys to help resist corrosion. Screw plug immersion heaters can come with mechanical thermostats for amperage of up to 25 single phase/15 amps 3 phase. Thermowells are also available to be used with thermocouples in applications requiring more precise measurement. Lengths of Wattco screw plugs are custom made to the size of your tanks however many standard lengths are available stock. Hazardous locations using liquids with low flash points require explosion proof housings (NEMA 7). All Wattco screw plug immersion heaters are CSA and UL certified. Over the Side Heaters are a popular product for economic and practical uses. Using a water-resistant terminal housing, these industrial heaters come in many shapes and sizes to fit within your tank dimensions and specifications. Wattco over the side heaters are custom designed with multiple tubular elements and a thermowell to hold your temperature probe. Shaped to fit within your standard (or non-standard tank) the economic feasibility meet the budget of any project manager. These mobility of these heaters to be able to be used in more than one container allow it to be the choice of many project managers. Wattco uses high quality stainless steel and other exotic alloys to meet the requirements of any application. Together with a digital controller, this heater becomes the perfect solution to heating large containers with no access to the liquid except from the top. Brackets are used to support the heater onto the wall of the tank and cold sections are carefully calculated to prevent over heating when water or liquid levels drop below certain levels as a result of evaporation or drainage. Using high quality alloys, Wattco over the side heaters are strong enough to physically withstand many harsh environments both indoors and outdoors. Commonly used in petroleum and chemical industries it is an exceptional choice for projects with limited budgets.